UNITED NATIONS, February 13 -- For two weeks, UN Secretary General Ban Ki-moon and his spokesman have responded to Inner City Press' questions about the selection as "Senior Adviser on Peacekeeping Operations" of Shavendra Silva, whose Division 58 is repeatedly named in connection with war crimes in Secretary General Ban Ki-moon's Panel of Experts report on Sri Lanka, by saying there is nothing the UN can do, the selection is entirely up to member states. 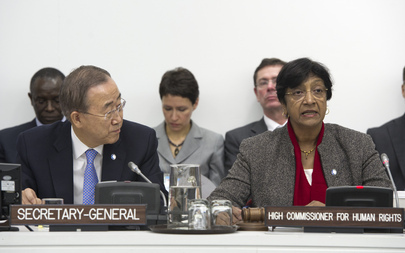 But on February 13, when Inner City Press asked UN High Commissioner on Human Rights Navi Pillay about Silva, she replied on camera and on the record that "It's a matter of concern. The United Nations has very clear policies on vetting and this is part of the work that my office does. We keep a list of individuals who are suspected of committing human rights violations and I have addressed a letter of concern to the secretary-general about this individual" - that is, Silva. On February 14, Inner City Press asked Ban's spokesman Martin Nesirky to confirm receipt of the letter, and to explain why the UN's system of "vetting," which for example led the UN to not accept as a peacekeeper a Nepalese military official charged with war crimes, wouldn't apply to a UN "Senior Adviser on Peacekeeping Operations." Nesirky replied, "yes a letter was received," then again said "it is a matter for member states." Video here, from Minute 20. Inner City Press again asked how Ban could, disagreeing with the UN's own High Commissioner on Human Rights, not be consistent and use the "vetting" system applicable to officials sent from individual member states as peacekeepers to a Senior Adviser on Peacekeeping that emerged from the Asian Group (where, as Inner City Press first reported, there was no election, with Nepal and Saudi Arabia being convinced to stand down). Nesirky argued that vetting doesn't apply because "there is a General Assembly resolution." But UN Peacekeeping itself is governed by General Assembly as well as Security Council resolutions. "While noting the important contribution that the Nepal Army has made to UN peacekeeping missions, [the UN's] Mr. Bennett stated that until an independent and impartial vetting mechanism is put into place, the promotion, extension, or nomination for UN service of individuals alleged to have committed violations should be suspended." "Under circumstances of limited or delayed criminal prosecutions, vetting can also help to fill the 'impunity gap' by ensuring that those responsible for past abuses at least do not continue to enjoy the rewards and privileges of public office." So why would Ban Ki-moon be exempting Senior Advisers, or at least Sri Lanka's Shavendra Silva, from the vetting applicable to ordinary peacekeepers? We'll see. Footnote: After Ban Ki-moon himself told Inner City Press that, on Silva, it was decided by member states, and Inner City Press reported this, Sri Lanka's Mission to the UN wrote a letter of complaint to Inner City Press, sending a copy to Ban's spokesman as well as to some in the UN press corps. Inner City Press in less than 24 hours published and responded to the letter, citing only some of the many references to Silva's Division 58 in the report. Now, the Mission has taken to issuing statements to UN correspondents who never wrote about the underlying Silva controversy -- while the country seeks to block media websites. Watch this site.